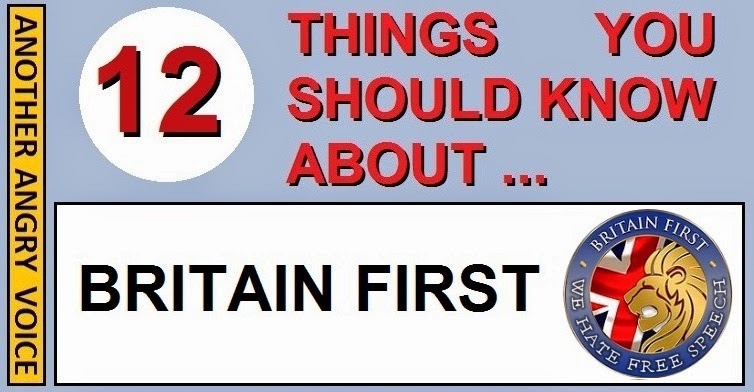 In this article I am going to explain twelve things you should know about the extreme-right hate group called Britain First. Britain First was founded by a guy called Jim Dowson who ran a British National Party call centre in Belfast until he abandoned the party after being accused of indecently assaulting a woman in a hotel room. Dowson tried to claim that the accusations were part of a "dirty tricks" campaign to discredit him because he opposed BNP leader Nick Griffin's plan to comply with court rulings to remove discriminatory clauses from the BNP constitution. It's not much of a defence to say that the accusations against him were fabricated because he was even more right-wing than Nick Griffin, but that's the story he came out with. Jim Dowson has got a track record of involvement with loyalist paramilitary groups in Northern Ireland, and with anti-women's rights groups. He is also very open about his homophobic views. The treasurer of Britain First is also an ex-BNP man. Paul Golding was a BNP councilor in Sevenoaks between 2009 and 2011 and he also served as the BNP's communication officer. This ex-BNP pair stood as the Britain First candidates in Wales and Scotland in the 2014 European elections. As Britain First didn't stand any candidates in England, they advised their followers to vote for UKIP, which would hardly seem to be the kind of endorsement that Nigel Farage would want for his "we're definitely not fascists" party. UPDATE: Britain First founder Jim Dowson quit in July 2014 saying that "No matter how many times I told [Paul Golding] I did not want decent Muslims intimidated, he just continued doing it ... I have come to the conclusion that no matter how hard I tried, you cannot escape from the fact that the group is being overrun with racists and extremists". Over one million people have decided to "like" Britain First's Facebook page, meaning this extreme-right hate group has more followers than any other political party in the UK. It should be a source of acute national embarrassment that at a time when the British public should be looking to genuine political alternatives to the bankrupt neoliberal status quo in Westminster, that hundreds of thousands of people are turning to an extreme-right hate group hell bent on scapegoating minorities, and that these followers are spreading the Britain First messages of hate and fear all over Facebook. 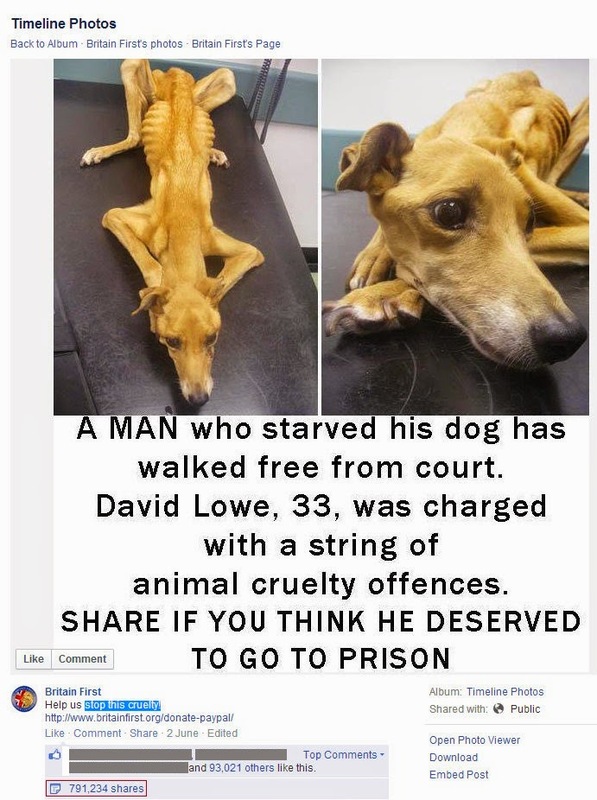 One of the most distasteful things about Britain First is the way that they elicit donations to their right-wing political party through animal cruelty shock tactics. The image to the right is one of their most popular fundraising campaigns ever (shared a mind-boggling 791,234 times). The image description says "help us stop this cruelty!" and includes a link to their Paypal donations page. The problem is that Britain First have made absolutely no effort to segregate funds raised through this "help us stop this cruelty!" appeal from their general donations. Neither have they explained anywhere how they plan to use all of this money to actually prevent animal cruelty. Britain First believe that they can get away with appealing to people's good nature (abhorrence at animal cruelty) in order to soak up huge numbers of donations from unsuspecting people who imagine that their donations will be used to prevent animal cruelty, rather than fund an extreme-right political party. In my view Britain First are guilty of obtaining party political donations under false pretenses, and of illegally funding their political party with overseas donations. I have written to the Electoral Commission to ask what they plan to do about it. One of the most commonly occurring images on the Britain First Facebook page and on the Britain First website is a picture of the murdered soldier Lee Rigby. It is absolutely sickening that they choose to continue desecrating his memory by making him the "poster boy" of their extreme-right hate group despite the objections of his family. In the 2014 European Elections they even used the phrase "Remember Lee Rigby" as their party description on the ballot papers in Wales. The Electoral Commission were hit by a tidal wave of condemnation for allowing them to use Lee Rigby's name like that, and eventually issued a groveling apology to the Rigby family. Here's what Lee Rigby's mother had to say about their use of his name on the ballot paper. Another one of Britain First's most disgusting tactics is to desecrate the poppy symbol by using it to raise funds for their extreme-right hate group. The worst thing about it is that some vulnerable people may see the poppies and think that they're donating to a cause which helps former soldiers, rather than an extreme-right hate group. The Royal British Legion have been informed that Britain First are using the poppy symbol to sell their tatty jackets and t-shirts, but even if the RBL come out and condemn this tactic in the strongest terms, one would expect Britain First to completely ignore them, just as they completely ignore the suffering they are inflicting on Lyn Rigby. Britain First are also guilty of spreading outright lies on their Facebook page. In one widely shared Britain First meme they claim that asylum seekers and illegal immigrants receive £29,900 per year in benefits. Asylum Seekers and illegal immigrants are not the same thing, so they wouldn't have the same entitlements. Illegal immigrants are not even entitled to benefits. Given that they are in the country illegally they are extremely unlikely to turn up at the Jobcentre asking for benefits. The Tory benefits cap was introduced at £26,000 per year, so it seems more than a little unlikely that they are giving £29,900 per year to illegal immigrants. The extreme right love to use the argument that "we can't even talk about immigration without being labeled racists and bigots". The problem is of course that they're not just "talking about" immigration, they are spreading outright lies about immigration. In my view it is unacceptable to label someone a racist or a bigot if they raise legitimate concerns about immigration. However, if they resort to spreading outright lies about the subject in order to stir up resentment and hatred of immigrants, then fire away, because those are clearly the tactics of racists and bigots. The admins on the Britain First Facebook page are an appalling bunch of hypocrites. They whine endlessly that their views are under threat from censorship, however they have a policy of purging their page of any critical comments and banning dissenting voices from ever coming back again. Dozens and dozens of people have told me how they were banned from Britain First for daring to leave non-conformist comments, but you don't have to take my word for it, the Britain First admins are quite open about the way they routinely delete all critical comments. If you still don't believe it, maybe you should try leaving a couple of politely worded criticisms (you shouldn't use the poppy symbol to raise funds for your own political party) or questions (what exactly have you done with the money raised through your animal welfare appeal?) and see how long it is before you experience the Britain First "delete and ban" treatment yourself. To harp on and on about "free speech" whilst simultaneously engaging in one of the biggest mass censorship campaigns Facebook has ever seen is such an appalling display of hypocrisy that anyone, no matter what their political orientation, should be shocked by it. These people hate free speech, and they only ever invoke it to claim that they have the right to do and say whatever they like (conning people out of money with animal cruelty shock tactics, debasing the poppy symbol, making a dead soldier their "poster boy" despite the protestations of his family, telling outright lies). When it comes to other people's free speech the Britain First admins can't hit the "block and ban" button quickly enough. In their view freedom of speech is the freedom to agree with them, if you happen to disagree with them, then freedom of speech doesn't exist for you. The fact that they have censored such a huge number of people has inspired me to come up with this "I've been censored by Britain First" certificate which people can use as their Facebook banner image, because it should be a mark of pride that you've been censored by a bunch of extreme-right hatemongers. The Britain First Facebook page is a classic example of a closed ideology echo chamber, in which information, ideas, and beliefs are amplified or reinforced by transmission and repetition inside an enclosed system. Their policy of routinely purging the page of critical comments and banning dissenting voices demonstrates their commitment to keeping their followers brainwashed in an atmosphere of conformity. Any group or society in which people who ask awkward questions or present counter-evidence are routinely censored is clearly a closed ideology echo chamber. With over 400,000 followers the Britain First Facebook page is one of the biggest examples of a ruthlessly enforced closed ideology environment in the history of Facebook. The American author Laurence Britt defined 14 characteristics of fascist regimes (you can see a copy of his article here). 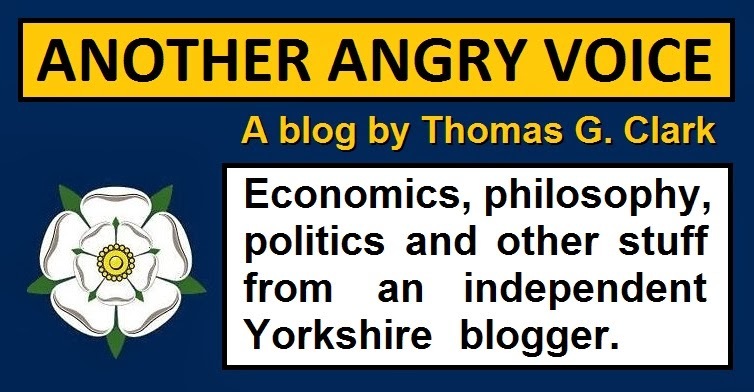 I'll list the 14 characteristics and compare with Britain First policies and strategies. 1. Powerful and Continuing Nationalism - Britain First make constant use of patriotic mottoes, slogans, symbols and other paraphernalia. Flags are seen everywhere, as are flag symbols on clothing and in public displays. 2. Disdain for the importance of human rights - One of Britain First's most common complaints is against the European Human Rights Act. 3. Identification of Enemies/Scapegoats as a Unifying Cause - Britain First rally people into a unifying patriotic frenzy over the need to eliminate a perceived common threat or foe: racial, ethnic or religious minorities; liberals; communists; socialists, terrorists, etc. 4. The supremacy of the military/avid militarism - Britain First constantly intersperse their posts with posts designed to glorify the military (often in order to sell their own merchandise or convince people to sign up to their organisation). 5. Rampant sexism - Britain First's founder Jim Dowson is strongly opposed to women's reproductive rights. This subject is never mentioned on the Britain First page because it would interfere with their populist appeal. 6. Controlled Mass Media - Thankfully Britain First haven't got to the stage where they can exert any control over the media, however their policy of ruthlessly censoring dissenting opinion on their Facebook page indicates their contempt for freedom of speech and their desire to control the spread of information. 7. Obsession with national security - Britain First are always harping on about threats to national security in order to whip up fear amongst their followers. 8. Religion and ruling elite tied together - Fortunately Britain First are not part of the ruling elite, but it is absolutely clear that they see religion as an integral part of their political mission. Here's a quote from their statement of principles: "Britain First is committed to maintaining and strengthening Christianity as the foundation of our society and culture". 9. Corporate Power is Protected - Britain First like to present themselves as an alternative to globalisation, however their dalliance with the neoliberal Tea Party fringe in the US show that they have more in common with hardline neoliberals than they like to let on. Another indicator that they are no opponents of globalisation is the way they use their Facebook page and website to propagandise for Cadbury's, which was once a British company, but is now owned by the American multinational giant Kraft. 10. Power of labor suppressed or eliminated - Britain First make a big deal out of opposing socialism and trade unions as enemy ideologies and they also use their Facebook page to attack the minimum wage. 11. Disdain and suppression of intellectuals and the arts - The Britain First Facebook page is rife with anti-intellectual comments and infographics. 12. Obsession with Crime and Punishment - Britain First are obsessed with crime and punishment, making frequent calls for the death penalty to be re-introduced. Nooses and gallows are recurring motifs on the Britain First page, and they also use public outrage at judicial decisions, in order to con people into donating to their political party. 13. Rampant cronyism and corruption - Thankfully Britain First have no political power, so they are not in the position to use their power to enrich themselves and their cronies, but judging by the fact that there is no open process over how appointments are made within the party, and their deceitful fundraising tactics, it's not hard to imagine what Britain would be like if these guys were in charge. 14. Fraudulent elections - Once again, these guys are not in charge of the country, so they haven't got the power to rig elections in their own favour. Of the fourteen characteristics of fascism identified by Laurence Britt, Britain First meet most of them, and the only ones they don't meet are the ones that it is impossible for them to meet due to their absolute lack of political power. A severe economic depression followed by the rapid rise of right-wing nationalist extremism and the scapegoating of minority groups seems to be a case of history repeating itself. An interesting contrast can be made with the rise of the left-wing anti-corruption party Podemos (We Can) in Spain. They experienced a similar lightning rise in popularity, with their Facebook page passing 500,000 followers within three months of the foundation of the party. But instead of fostering fear and and inciting hatred of minorities, they lay the blame firmly at the door of the corrupt Spanish establishment and propose reforms to put political power back into the hands of the people. Podemos are committed to fighting corruption and increasing people power through democratic participation. Britain First are committed to parading around on paramilitary style marches, invading mosques, scamming money from unsuspecting people and spreading outright lies. It's pretty sad that in Spain, a country that was still ruled over by a fascist dictatorship less than 40 years ago, people are looking to a party that presents a real alternative to neoliberalism and corruption, whilst in Britain, a country that has never experience a full-on fascist regime, people are looking to the extreme-right fringe in their hundreds of thousands. Given the enormous sacrifices made by previous generations in the fight against fascism, it is a national disgrace that right-wing extremism is on the rise in the UK. What makes it even worse is the fact that Britain First use those very sacrifices in order to raise funds for their own brand of right-wing extremism. Given that it is impossible to fight back against Britain First on their own page due to their "delete and ban" censorship policy for all dissenting voices, people who oppose Britain First's brand of right-wing extremism need to find other ways of criticising them. In this section I'll outline a few tactics. Criticise the shared versions of their images - Britain First can use their admin powers to delete all criticism from the original iterations of their pictures, but they can't delete criticism on the new iterations that are created when their followers share their work. If you see any of your Facebook friends sharing Britain First images, you can leave comments expressing your distaste. Report them - If you see Britain First using deceitful tactics to raise party donations you can report them to the Electoral Commission. If you see them using poppy images to sell their own merchandise you can report them to the Royal British Legion. If you see any Britain First posts that you consider to be in breech of Facebook terms and conditions, you can report them to Facebook. If you see them using Royal Crests and you suspect they have no permission, you can report them to The Lord Chamberlain's Office. If you see anyone posting unlawful comments on there (such as incitement to murder, racist or religious hate crime, criminal threats ...) you can report the individual to the police. If you see someone using making extremist and offensive statements(using the term "muzrats" to describe Muslims, or calling for a Nazi style holocaust against all Muslims) you can click on their profile and see if their employer is listed and send screen shots of their extremist comments to their employers. Convince your friends to unlike the page - Clicking this link allows you to find out which of your Facebook friends follow the Britain First page. You could consider sending them a message explaining your objections to this extreme-right hate group and asking them to consider unliking the page (feel free to follow these 3 simple steps if you like). Spread awareness - You can spread awareness of Britain First's disgustingly hypocritical censorship policy by using this "I've been censored by Britain First" certificate as your Facebook banner. Laugh at them - There are several Britain First parody pages out there including Britain Furst and Britian First. Sometimes the best thing to do when it comes to the extreme-right fascist fringe is to take the piss out of them and laugh at them. Who actually approves of this grotesque Tory barbarism?